Welcome to Jacqueline Howett's official website. Jacqueline Howett- novelist, poet and artist. Welcome! 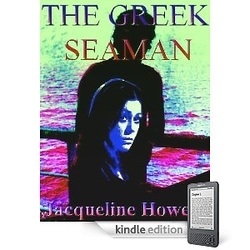 The Greek Seaman- Romance adventure - suspense on the high seas. A novel based on a true story from my own life in my teens. Note: The Greek Seaman ebook novel was removed to be given another proof-edit in order to satisfy some readers. Sorry for the delay, I've been working on several other projects in the process. Don't forget to check my Blog for all major updates. I know, I haven't blogged in a while, but I'm still here. The thunder clapped and the mysterious voice of the sea made itself known about them, and as the ship made its sudden precipitous descent once more it rendered them powerless to move. The captain shook his head. "This is not a hurricane, this is something else. I have never seen a hurricane like this before, have you?" What is an eighteen year old newly wed doing travelling on a massive merchant ship anyways? Hadn’t she gone to Greece on tour in a ballet as a dancer? These are questions Katy asks herself while travelling the high seas with Don, her Chief Officer husband. However, little do they know a smuggling ring is also on board for this ride. When explosions, injured sailors, and threats to sink the ship for the insurance turns into the smugglers perfect cover up plan, Don and Katy must try to save themselves. Various ships pass in the night, and the smugglers must finally try and reach their last contact aboard a rescue operation coming from Malta in order to complete their blue diamond exchange. This is an exciting sea adventure with just enough suspense, and romance to take you on a voyage to experience magnificent, soothing wonders of the sea, before taking you through storms and hurricanes where Katy also finds herself at times alone on the bridge navigating through it with a seasick crew. From Piraeus, Greece, you'll visit the ports of Lebanon and Libya, and enjoy the exotic magic of the bazaar. The love between Don and Katy in their ordeal at sea makes this a memorable story. Reviews posted at Amazon before March 2011, prior to my misfortunate mishap and graffiti. 5 stars from amazon UK. For The Greek Seaman novel. from Amazon- USA for The Greek Seaman novel. However, odds of making that final click are slim. One reason is the spelling and grammar errors, which come so quickly that, especially in the first several chapters, it’s difficult to get into the book without being jarred back to reality as you attempt unraveling what the author meant. At times, you’ll be engrossed in story when you’ll run across a flowery description of the emotions Katy is feeling about her situation or her husband. These are numerous and sometimes very good. Chances are one of these sections originally pulled you so deeply into Katy’s world. Then you’ll run into one that doesn’t work and get derailed again. Reading shouldn’t be that hard. Product Description. Amorphous Angelic, selected poems by Jacqueline Howett are poems of wisdom, death, rebirth, and the inner workings of the souls journey. They are also 35 selected poems of love, inspiration, wonder, visons, hope, faith and connecting to the higher self as well as with the sad & strange, to elevating out of darkness, to reveal the mystery of life that cover an important time factor in the poets life between 1980-1985, while still living in London, England and have remained her most memorable since she moved to live in America. Just got done reading and re-reading the of poems. I loved so many of them and they held special meaning with me. My favorities are "How Many butterflies Can You Be" and "Until I Rest In Jesus". P.S. After reading this book it gave so much more meaning and appreciation for the author and person as I just finished her book "The Greek Seaman". Click on book to buy your Kindle copy of my poetry. 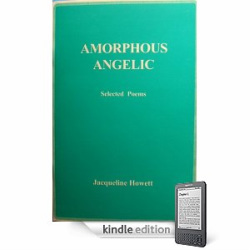 Amorphous Angelic Selected poems by Jacqueline Howett has been published at Borders, amazon and local stores and is now available in some libraires. It is now finally here as a Kindle eBook at Amazon and at Smashwords in various formats You can now download right to your computer also without a Kindle. You just download the Kindle APP. For a signed copy, please query by E-mail the author. Signed copies are twelve dollars. Place in E-mail description: Signed copy of Poetry book AA, Thanks, Jacqueline. Free samples of my poetry from my book Amorphous Angelic, are also posted here, or download samples from amazon or smashwords. Click on link here or from the side bar called, My other Poems. The Secret Passion of Twins. Short Story eBook. Buy at Smashwords or Amazon $0.99 cents. Ebook Description. Short Story. Approx: 3000 words. They say twins know eachother's thoughts, but are these twins in denial of this while on vacation? When it comes to much needed love and there's just one man who secretly wins the heart of these twins, in reality only one can have him. It may appear everyone's in denial as they live out a fantasy with deep, and somewhat strange psycholigical consequences, while learning to let go of the guilt of a tragic family accident. Available now at Smashwords, and Amazon Kindle. If you enjoyed reading this very short story, kindly leave a comment. Thanks. You'll notice something about the writer's choice of words that locks the reader in and won't let him go. One of those talents all of us writers envy and seems to come so natural for Jacqueline Howett, though it is the result of years of writing in a number of different occupations. For the lover of short stories, this is one you must experience as Mr's Howett writes with a modest elegance and compassion for these twin sisters; the one who was confined to the wheelchair and the one who was not. It will make you think of life's strange twists and turns and the inner strength it takes to sometimes adjust. My (2nd novel) is still in the works. It has taken longer than I expected to sort out through 370,000 words of this novel, and what I intend to do with it. (There is hot content here to consider.) It was cut to 90,000 words at one point. That's quite a major cut. So, I have moved it back to being just a WIP ('work in progress.') for now. Also, I'm considering a name change on this one and a new cover. My third novel, a WIP, takes place in America in present times, and this is all I shall reveal for the moment. It's only in first draft and has no book cover as yet. The title has also changed several times as the story matured over the years, but it's coming along nicely. There's also a forth and a fifth novel and various shorts, and other poetry books. Don't forget to check out my art page. I have now my art prints selling at Fine Art America. Concerning queries, questions, requests or chit-chat, I like receiving private e-mail best. My e-mail is checked mostly every day, or you can send private notes to Facebook or on my Blog. Thanks for stopping by. Jacqueline.